As part of my final FINAL reckoning with my UBC graduation requirements as I prepare to move back to Japan to welcome my son into the world, I am going to be devoting part of my blog space over the course of the next twelve weeks or so to discussing some selected readings around progressivism in education in the United States. I will link the course syllabus and rationale here: FISHER EDST 580 Proposal. As you can see, I’m a little behind schedule already with the blog posts. But I aim to be caught up by the end of next week. 1. What progressivism in higher education meant for its practitioners, promoters and philosophers during its heyday in the first third of the 20th century. 2. What impacts progressivism has had in higher education in terms of curriculum and other structural changes to institutions. 3. How progressivism continues to (or fails to) influence the way we think and do higher education in the 21st century. A few texts kind of exist in the background of my readings for this course, even though I will not be reading them this term. John Dewey’s Democracy in Education (1916) is one. Another is Lawrence Cremin’s Transformation of the School (1961). Granted we have gone beyond the reform programs of the last generation, there are still kindergartens that could learn much from Patty Smith Hill, slum schools which could take profitable lessons from Jane Addams, and colleges which still haven’t realized that the natural curiosity of the young can be a magnificent propellant to learning. The Progressive Education Association is dead; and progressive education itself needs searching reappraisal. But I think we will find that some of the best of what the progressives tried to teach has yet to be applied in American schools (Cremin 1954, quoted in Reese 2013). I couldn’t agree more with Cremin’s 1954 appraisal. And furthermore, I’d be willing to apply most of what he says here to 2014. As Cremin outlines elsewhere in this speech in some detail, progressivism in education was always in some sense opposed to more conservative American cultural movements. On this basis, nearly 60 years after Cremin was writing, with neo-conservative elements dominating the education system in the United States again, a return to progressive educational values is long overdue. In my reading for this week, William J. Reese, in a 2013 History of Education article, gives a good exposition of the history of progressive education in the United States, with emphasis on the Lawrence Cremin’s contribution to the historiography of the movement during its decline in the middle of the 20th Century. Reese, I think rightly, points out that whatever claims historians like Cremin have made about the dominance of progressivism as a political ideology or otherwise as a social force in American society, adherence to “progressivism” meant many different things to the different actors in American education systems. So, clearly, as Reese warns, relying on the writings of only a few elite public intellectuals like John Dewey, or Jane Addams as exemplars of progressive voices, elides much of the complexity of the larger movement. And the work that these early activists, philosophers and teachers started still needs to continue. Despite the added complexity that Reese wants to add to the history of progressivism in education, he is still comfortable identifying a few overarching ideas that can reliably be glossed as central to the movement. Reese does not go so far as to deny that progressivism in education exists as a cohesive movement as he says Herbert M. Kliebard has argued. But the picture of progressivism Reese presents is arguably broader since it includes individual teachers and schools that Cremin excluded in his intellectual history that relied heavily on the writings of influential figures like Dewey and others, who were not always teachers themselves but theorists or in some cases administrators. I think that overall Reese’s expanded, complexifying historiography of progressivism in education is a good step to take. But I also think that it continues to be important to return to the authors of the central texts of the movement. At the beginning of his article, Reese admits that a lot of the dissonant interpretations of the meanings of progressivism in education stem from mis-readings (intentional or not) of primary philosophical texts of the movement. 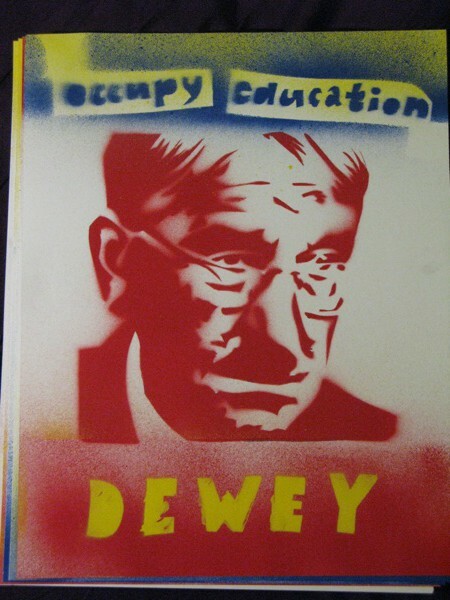 Dewey is one author who is as well known for misinterpretations of his philosophy as he is for his philosophy itself. And this is a problem that Reese admits would be helped if more historians, teachers and school administrators actually read Dewey’s writing. Reese’s reading of Cremin recommends a multi-pronged approach to the historiography of progressivism in education: one that includes the voices of public intellectuals like Dewey, Addams, Freire, and Horton, as well as the voices of teachers and others who were responsible for bringing these well known progressive ideas about education into practice. This is precisely what I aim to do over the course of the next 12 weeks in my guided reading course, EDST 380. You will be able to find updates on this blog tagged with the course number, EDST 380, as well as other specific topics from the syllabus as appropriate. And I will include links to electronic versions of each weeks’ readings as I am able to as well. Check back later this week for some discussion of more of the philosophical origins of progressivism in education. Specifically, I’m excited to take a look at philosopher Sidney Hook’s stab at The Metaphysics of Pragmatism. Hook was a student of John Dewey, and according to Westbrook (1991) was Dewey’s intellectual heir apparent except for his more open affinities with Marxism. Hook was also briefly considered as a candidate to serve with Dewey on the Advisory Council of Black Mountain College, as some of my research into Dewey’s correspondence with the college indicates. P.S. I have cited a lot of other people’s writing here in not particularly clear fashion. This is partially because I think that the dictates of style manuals like the APA get unwieldy VERY quickly when they are used on the Internet. Details about most authors and writing I refer to can be found in the syllabus for the course. I will likely include some bibliographic references in future posts. But while I am not treating these blog entries as “formal” “peer-reviewed” essays in the same sense as my graduating paper, I do anticipate this writing being reviewed and read by my peers. To that end, please use the comment space below freely, especially if a source I am using is unclear. This entry was posted in History, Learning, Philosophy, Politics, Uncategorized and tagged EDST 580, progressivism, progressivism in education by fish. Bookmark the permalink.